Strategic HR Lawyer offers a reminder that as of February 1, employers have annual OSHA posting requirements for job-related injuries that occurred last year. Phillip Wilson of Laboring Away at the Institute links to a recent BLS report on union membership. Last year, union membership in the private sector fell to less than 8%; in the public sector, it fell to 36.4%, a drop of a percentage point form the prior year. In another post, he discusses possible reasons for the decline. Also of interest is his post on why workers join unions. Managed Care Matters points to an article in Health Affairs reporting that medical inflation was 7.7 percent in 2003. Joe Paduda notes that this is significantly less than the prior year’s 9.3 percent rate, but still higher than the overall rate of inflation. He also notes out that the news for workers comp is less optimistic with a medical trend rate of 12 percent. Workforce features an excellent article discussing employment at will and terminating employees while preventing lawsuits. Thanks to George’s Employment Blawg for the pointer. 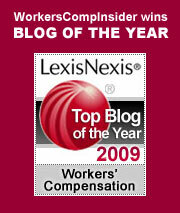 Jordan Barab at Confined Space has blogs about the rise in steelworker deaths and injuries and he also has a comprehensive post on the shocking work conditions in the meat and poultry industry, including a link to a recent 100+ page report by Human Rights Watch entitled Blood, Sweat, and Fear, Workers� Rights in U.S. Meat and Poultry Plants. RawblogXport points us to an article on the health hazards and control measures for lead in the workplace. Two of our favorite bloggers have speaking engagements this week. On February 1, Judge Robert Vonada is presenting a Workers’ Compensation Law Update at Joyner Sportsmedicine Institute in Roaring Spring, Pennsylvania. On February 2, attorney Michael Fitzgibbon will be speaking at the Human Resources Professional Association of Ontario (HRPAO) Annual Conference on Progressive Discipline in the Non-Union Workplace. For the most part, the vaccination is safe: the rate of adverse response to the vaccine is relatively small (1,000 serious reactions for every million vaccinated). However, given the scale of the anticipated inoculations that would be needed if all health care providers needed protection, there is cause for concern. Under rare circumstances the vaccine can lead to death. After vaccination, the individual is potentially contagious, for up to three weeks (as long as the vaccination site remains open). This means that health care workers — primary targets for vaccination — might not be able to work for a significant period of time. There is a portion of the general population that is at higher risk for adverse reaction to the vaccine (e.g., people with a history of eczema or acne, HIV positive individuals, burn victims, cancer patients, pregnant women). There are guidelines for screening these individuals out of a vaccination program. If employers require their employees to be vaccinated, any adverse responses would certainly be covered by workers comp, up to and including death. Even if the vaccination is “voluntary,” adverse reactions are still likely to be covered by workers comp. There is a potential “disproportionate impact” on insurers of health care facilities and ambulance services, whose workers are first in line for vaccination. This exposure is not currently contemplated in workers comp rates. Regarding the significant portion of the general population that is at higher risk for adverse reaction to the vaccine (see above), many of these vulnerable individuals work in health care facilities, where their not being vaccinated might put them at higher risk for serious illness. If exposed to smallpox, they would be at very high risk when they are compelled to take the vaccine to stave off the illness. As if the real risks were not enough, the considerable publicity about the dangers of the vaccine significantly increases the probability of “false positives” — people reporting what may be imaginary ailments. These “false positives” would immediately appear on the workers comp radar screen. Here’s the crux of the problem for the health care industry: inoculated workers might not be allowed to come into contact with patients during their potentially contagious period (up to 21 days). This would apply especially to health care workers whose patients include the highly vulnerable groups mentioned above. This inability to work is not a period of “disability” but of quarantine. Workers comp would not apply. Who replaces the lost wages during this period? Is it fair to require workers to use their sick leave? What if they do not have any sick leave? Beyond that, if there is a mass inoculation of health care workers, how will hospitals staff their facilities during the quarantine period? As if all the above weren’t enough to worry about, during the contagious period, a worker might infect family members. How would these exposures be covered? This is not meant as a definitive summary of the smallpox policy issues. However, it is clear that any mass inoculation program will raise a number of concerns that need to be confronted head on, not as we are currently doing, with our heads buried in the sand. The world of insurance is built upon the concept of risk transfer: instead of taking on the full cost of risk, we buy insurance. For a fraction of the cost of what we might lose, we pay premiums to transfer the (relatively) remote risk to someone else. But what if the activity involves enormous risk? And what if the people seeking insurance are by definition thrill seekers and lovers of danger? How would you underwrite them? To frame the article, Duhigg tells the story of a well-planned climb gone bad, with one climber nearly paralyzed after being hit by a falling rock and the other without a cell phone to call for help. They are eventually rescued — and Global picks up the tab. Some people feel more alive when they are at risk. That’s why they climb the mountain in the first place. The riskier the climb, the greater the challenge. But how does an underwriter sort out the reasonable risk (the prudent risk-taker) from the reckless? It appears that Global is a profitable company, so they must be making good decisions. In the meantime, as we approach each day with our own little risk assessments that range which shoes to put on in the morning to when to cross the street, it’s comforting to know that some people are making risk assessments that dwarf anything that we have to deal with. Better them than us. Restaurant Workers in NYC: Bad jobs = Bad risks? In a fascinating study of restaurant workers in New York City, the Restaurant Opportunities Center of New York presents the results of a survey of over 500 workers and over 30 employers in the industry. There are about 165,000 restaurant jobs in the city, comprising 4.8% of the workforce. The median wage for these workers is $9.11 (meaning, of course, that half make less than that amount!). Fully 90% of the workers receive no health insurance benefits. Most have no paid vacation and no paid sick leave. The majority of the workers are Hispanic and Asian. The jobs are for the most part dead end, with no training and no focus on safety and health. In addition to long hours, low wages and no benefits, many of these workers are subjected to very difficult working conditions: hot kitchens, slippery floors, aging equipment. Discriminatory practices are rampant. If workers miss time due to illness or family emergencies, they are usually fired. The turnover rate is very high. As we review this litany of third world conditions for thousands of restaurant workers in New York City — and then multiply that by similar conditions in major cities throughout the country — some might well ask, “so what? It’s not my problem!” Ah, but it could easily become your problem. Poorly trained workers may not handle your food properly. Workers without health benefits ignore their symptoms and drag themselves to work, day after day, thereby putting the eating public at risk. Lacking sick leave, desperate employees may bring highly contagious problems into the kitchens and serving areas. The report includes surveys of employers. They report the difficulty of operating in New York: the high rents, high fixed costs, the high cost of insurance. The uncertain market where they never quite know how many meals will be served. Some would like to pay benefits, but say they cannot afford it. To be sure, the report sites a number of successful restaurants taking the “high road” by paying good wages and benefits to a stable group of employees. In reading the 70 page report, I sought in vain for any reference to workers compensation. The report takes note of frequent workplace injuries — slips and falls, burns, cuts — but describes a process where the worker simply treats him or herself, or perhaps goes to the emergency room, where the bill ends up on the hospital’s tab. Where’s workers compensation? While health insurance, paid sick and vacation time are discretionary, employers must provide workers compensation coverage for all employees. Indeed, you would think that injured workers unable to perform their jobs would quickly latch on to comp, with its 100% health coverage and indemnity benefits. I am puzzled by the absence of any mention of comp benefits. It’s a classic conundrum: these “low road” restaurant operators, with their underpaid, low skilled, limited English speaking workforces, are poor comp risks. Comp benefits may be the only benefits on the table for these workers. On the other hand, it appears that workers comp, at least in this particular study, is off the radar screen. Not only is it not abused (as one might expect it to be), it is not even used for routine treatment of minor workplace injuries. I wonder how much these exploited workers know about their basic rights, from minimum wage and overtime to workers compensation. It’s food for thought, even as we sit down in a comfortable booth and wait for someone (what did he say his name was?) to deliver our meal. We recently talked about winterizing your workplace and the need for care in snow shoveling and heavy lifting, but in the light of the recent blizzards plaguing much of the country, it’s a good time to talk about winter driving safety. Of course, here in the Boston area, discussing this topic today is a bit like the proverbial closing of the barn door after the horse has escaped. But it’s only January – winter could hold many more surprises. For good advice on the topic, look to the North – if anyone ought to be experts on winter driving hazards, it should be our Canadian neighbors. The Canada Centre for Occupational Health and Safety has a comprehensive page on winter driving safety, ranging from preparing your vehicle and stocking a winter emergency kit to how to handle a skid and advice in case you are stranded in the snow. The Ontario Ministry of Transportation has specific advice on driving in whiteouts. Minnesota’s Department of Transportation also has good information on managing winter driving hazards, including tips for safe driving near or around snowplows and the hazards of black ice. Allow extra time today and travel safely! Actuary.net is a weblog and newsfeed about global actuarial news. It looks to be a fairly comprehensive resource for all things actuarial. George’s Employment Blawg offers tips for catching resume fraud. According ro a 2003 survey, about 52% of resumes had some “discrepancies. Joe Paduda at Managed Care Matters updates us on the impact of the California reforms and discusses hospital cost drivers. Jordan Barab is scheduled to appear on Air America Radio on Saturday from 6 to 7 pm. Jordan is a former OSHA official, a tireless safety advocate, and author of Confined Space weblog. Chronic beryllium disease (CBD) is an irreversible, debilitating and potentially fatal lung disease that occurs from exposure to beryllium. In 2004, after much foot-dragging, OSHA began monitoring inspectors for exposure to the substance. First results show that at least three workers, or 1.5 percent of the 200 inspectors examined so far, have become sensitized to beryllium. Occupational Hazards reports on this story and the history of the OSHA beryllium issue, along with comments by Adam Finkel, a former OSHA regional administrator and whistleblower whose actions sparked the eventual testing of workers. “Finkel filed a whistleblower complaint on the beryllium issue in 2003, charging that he was transferred because he was pushing for beryllium testing that neither the OSHA Administrator at the time, John Henshaw, nor his deputy, Davis Layne, wanted. The agency denied the retaliation claim, and according to the settlement agreement Finkel no longer works in an OSHA program: He now teaches at Princeton University. It’s boggling to think that OSHA officials would brush this aside, especially in that beryllium figured so prominently in the Department of Energy’s settlement with energy workers which we discussed in September and again in November. Go figure. Not very encouraging from an agency that is supposed to be advocating for the health and safety of the nation’s workers. This is a story that bears watching. Back on November 15 and 16, we blogged the problem of sleep deprivation for interning doctors and the potential negative impact on the treatment of injured workers. Interns are routinely on call for over 30 consecutive hours. Once beyond about 16 hours, they are more prone to making mistakes. Given that these sleep deprived doctors staff our emergency rooms, which are the first line of defense for injured workers, the potential for harm in the treatment provided to these workers is substantial. A new article in the New England Journal of Medicine indicates that the danger does not end when the seemingly interminable shift is finally over. Doctors who drive home after working these extended shifts are twice as likely to have accidents. Thus, their sleep deprivation, a product of a medical system that exploits the services of some of our most talented citizens, poses a risk to patients, to these highly trained and valued people themselves, and to the general public. Some steps have already been taken to reduce the number of hours interns are allowed to work. Nonetheless, extended shifts are still sanctioned by the Accreditation Council for Graduate Medical Education. Sleep deprivation (and low wages) appear to be a “rite of passage” into the ultimately prestigious and lucrative medical field. The working conditions of our young doctors are nothing less than scandalous. There is a powerful correlation between sleep deprivation and poor performance. If we are serious about providing good health care in this country, and if we are serious about providing decent working conditions for our valued medical professsionals-in-training, then we will find a way to put an end to the barbarous “on call” practices of our teaching hospitals. And for more on emerging medical technologies, Wired’s Med Tech Center usually has some interesting articles. You might also want to visit Engadget and Gizmodo, both fun sites for technophiles who are looking to be more efficient both on the job and off. And if you have a yen to put some of those new tech toys to use in your occupational practice, you might check out some of the news and reviews at MedPDA.net or Palmdoc Chronicles.